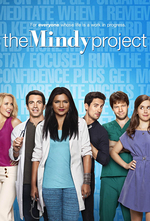 Mindy comes face-to-face with tax troubles and devises a plan to “rekindle” a fake relationship with Cliff, in order to save the practice from her fraudulent past. Meanwhile, Peter and Jeremy secretly try to outdo each other and win Lauren’s love. Can we say "Classic Mindy" after less than 50 episodes? Because this is classic Mindy/"Mindy". Problem comes up, she wacky-plans it, it all falls apart, and she doesn't learn anything but at least manages to come out the other side. Not enough Morgan. But then, there rarely is. Perfectly acceptable episode, strong B+. Also, it never fails to kill me when people call a character by the name of the show, so Danny rules. I love this show but I thought this episode was more miss than hit. The Lauren/Peter/Jeremy storyline didn't engage me at all. And there was nowhere near enough Morgan or Beverley this week. Agreed with the B+. We were convinced Lauren would marry Jeremy to keep him in the country and add some more drama to the triangle, but it was brushed off with the "I'm white and rich" joke. I'm not invested in their love triangle but there's something funny about watching Peter's self-esteem crumble. I'm a huge hypocrite because I complain when casts are too large, yet I'm all "Cliff! I missed Cliff!" and "It's the midwife!" I watch this show almost entirely for the one-liners. This show has the best zingers on television. Mostly the plots (especially the B-plots) are only OK. The show has a real problem with any of the supporting characters. But, flaws and all I laugh at the funny lines, and that is enough for me. Mark Duplass occasionally popping up is so divine. "Heathcliff"! He calls Cliff " Heathcliff"! It's these little things that make me forgive the general plot incoherence. I love this show, while being acutely aware of its flaws. Is it possible to hatewatch/lovewatch something? Or is that what hatewatching always was?